Of my earliest memories, one is if Sunday family get-together dinners. Grandma Myrtle would bring her rolls. It was already a tradition by the time I became aware of it all. Over the years I may have occasionally, for expediency sake, fallen into the habit buying rolls in a plastic bag. But there is no denying the fact there just is no comparison between the store-bought and the home made rolls; golden brown and enticing you with “come to the table aromas” of fresh baked bread. I don’t really know where she got the recipe but it dates back at least forty years and possibly much more. When I was of age to leave the family nest, I copied down the recipe and have used it ever since. Dissolve yeast in the 1/4 cup of warm water. Let sit until bubble start to form. In a large bowl, put sugar, shortening, egg and the 1 cup of warm water. Mix. Add the yeast mixture and mix until combined. Beat in the flour and salt. Cover with towel and place in a warm place to rise. When doubled, place in the refrigerator, tightly covere with plastic wrap, until ready to use. Form dough into rounds: If dough hasn’t deflate in the refrigerator, gently punch down. Roll dough into a log. Use a pastry knife to make individual pieces all the same size. Roll each piece between the palms of the hands to make a ball or round. Arrange rounds in a lightly floured 12x8-inch baking pan. 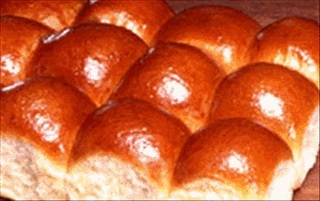 Cover with a towel, set in a warm place and allow rolls to rise. Bake in a preheated 400-450°F oven until golden brown. If desired, to make a glossy topped roll, paint tops of rolls with 1 egg white beaten with 1 tablespoon of milk. Apply when rounds have risen just enough to touch all around.